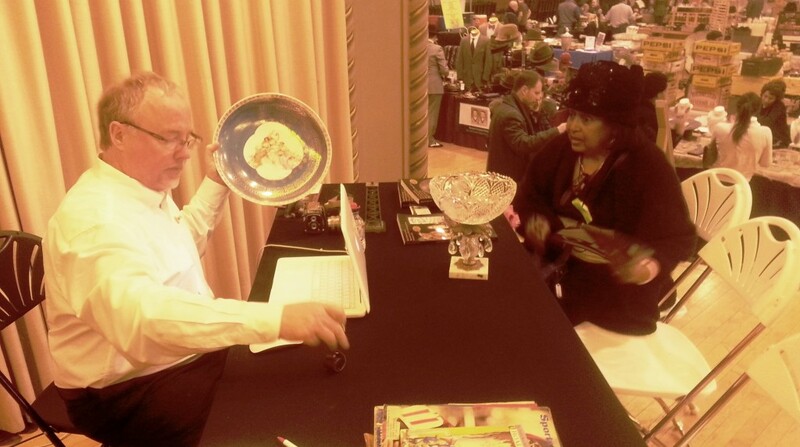 Worthologist Martin Willis working the valuation table at the January Wonderful Winter Market at the Randolph Street Market in Chicago. Just a day before I was to fly out to the January Wonderful Winter Market at the Randolph Street Market for WorthPoint, I got a delightful call from WorthPoint’s Christina Kapusta, who was organizing my flight and accommodations. The dilemma was the weather and whether I should go to the Chicago show. The polar vortex was threatening to drop down and freeze the country again. After a quick discussion on the subject, I decided to go anyway. What’s the difference between frigid temperatures in Chicago compared to the frigid temperatures in New England, where I live? Not all the people planning to set up booths and attend the show had the same option, as I found out later; cancelations were coming in to the show’s management office. Dialing back a little, I want to talk about people involved in setting up my appearance at the show to do a day of free valuations for show attendees. Will Seippel has a great business mind and a flare for tech; he is also a bona fide picker who just happens to be the founder and CEO of WorthPoint. I rarely meet up with Will without him excitedly talking about a recent great find or his endless search for something he collects. 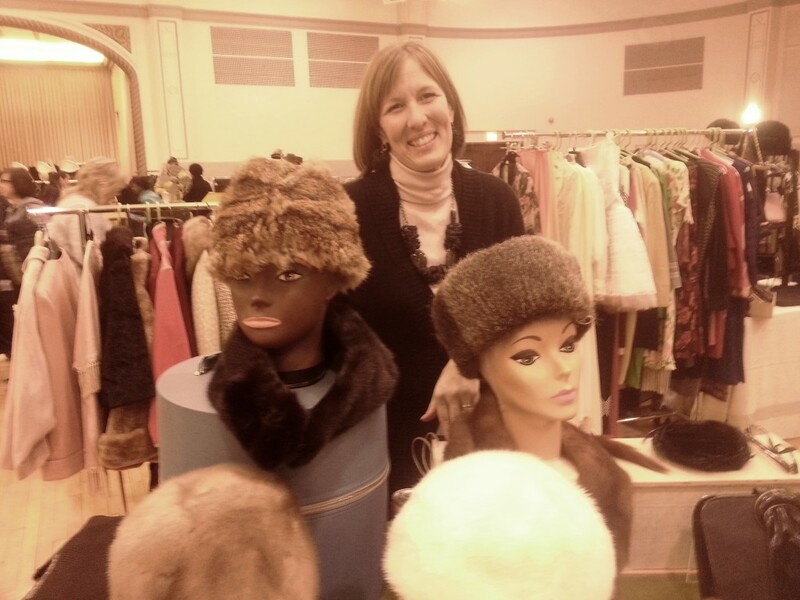 Sally Schwartz is a collector with a passion for vintage who just happens to be the owner of one of the biggest and most enjoyable antique events in Chicago, The Randolph Street Market. Knowing them both for some years, and working with WorthPoint, I knew the two connecting would be a great fit. There was never the hesitation, such as inviting friends to a dinner party. Marci Battersby was able to get a little extra floor space for her vintage fashions booth this month. In the summer of 2012, I first attended the Randolph Street Market with a couple other Worthologists to work an outdoor booth and appraisal clinic and we all hit it off like family. There was a lot of action and many memorable conversations with the great people of Chicago. When you work these kinds of booths for a few days, you often wonder what the impact was of your presence. Last spring, I came out and celebrated Randolph Street Market’s 10th anniversary and had a blast with Sally and some old friends. A woman named Holly came up to me as I was wearing a WorthPoint shirt and started a conversation. Holly attended when we were there in 2012, and she mention that she worked for a high-end estate sale service. A few months later, the company she worked for had a client that had a large and diverse collection. She was there when they were preparing a few weeks ahead of the sale. The owner of the company kept scratching her head while pricing the varied objects and she became frustrated. Holly suggested a WorthPoint membership, and the owner gave it a try. While using the service, she changed countless prices. When it was all said and done, she thanked Holly and told her that she believed that the sale had grossed an additional $4,000 or so with the use of the WorthPoint database. This is a great example of the impact this great tool has made in assisting professionals in the trade. During the winter months, the market is held inside the Plumber’s Union Hall, which is a wonderful example of art deco architecture, as well as having a powerful and memorable industrial mural on the staircase walls. If you have been paying attention to the weather in the Midwest this winter, you are aware of what trouble this could have been for travel to this late January show. Keeping in touch with Sally, I was aware of the cancelations and felt bad for her, as Sally puts her heart and soul into these events and has a great deal of money invested in each one. 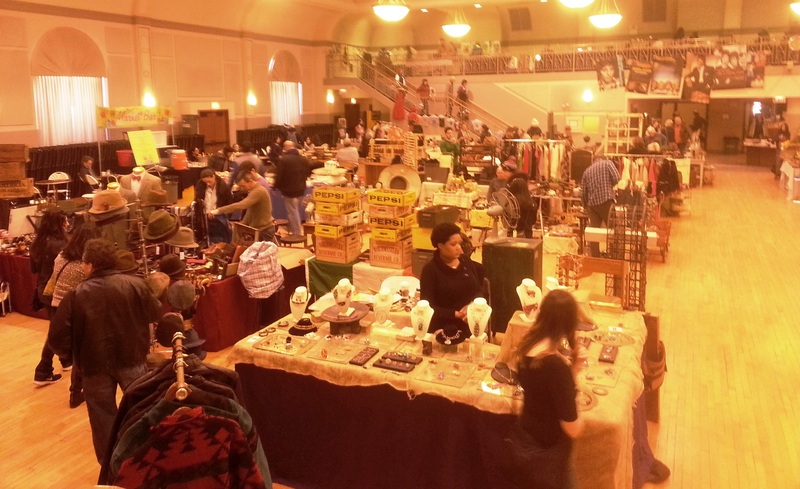 During the winter months, the Randolph Street Market is held inside the Chicago Plumber’s Union Hall. During the spring and summer, the market expands to the booths outside hall. I noticed someone heading for my valuation table and decided it was time to go to work. A nice lady brought in an East India vase, wondering if it was pure silver. I pointed out to her that you could see copper through the floral etched design, and told her that it was a tourist piece from the 1940s. People with their items started trickling in to the appraisal table, including a man with a collection of old Sports Illustrated magazines, (always fun to look at old hair styles). A woman brought a decorated charger that she thought was hand painted. It was actually a decal transfer, and I showed her how to tell, by looking for dots through a magnifier. I also saw some interesting cigarette lighters, Noritake china set, pressed glass and a carved miniature carousel horse that had me scratching my head for a few minutes. This piece looked authentic and, after very close scrutiny, I believe it to be a piece made in modern day China. The exotic wood under the paint, plus the carving on the underside of the hoofs, was something I had seen before in Chinese antique replicas made in our recent time. Back on the floor, after the clinic concluded, spirits of all the staff and all those I spoke to in attendance were high. I noticed the demographics of the crowd and most of the attendees were in the 20-30 age range, and that is not by accident. In a field where the younger people are rarely seen, Sally has found a way to make the monthly Randolph Street Market an event that these young people would not want to miss. WorthPoint will be back out there this June and I cannot wait to see my old friends and make new ones at the show that cannot be beat. The next Randolph Street Market is scheduled for March 29-30 from 10 a.m. to 5 p.m. For more information, visit the RSM website. Martin Willis is Worthologist, auctioneer and director of decorative arts for James D. Julia Auctioneers for the Boston region. You can hear his podcasts at the at Antique and Auction Forum, featuring interviews with key players in the antiques and collectibles trade.